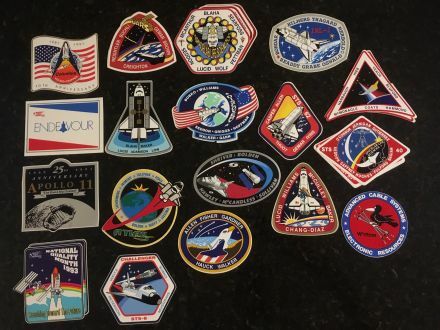 Here is a collection of patches and other stuff from various "aerospace" activities... The buttons on the left were for access to Edward AFB to see the shuttle landings. Most happened near sunrise and the view was better on the other side of the landing area with the sun at your back. That's pretty cool! Thanks for sharing those. I worked for Control Data in the 1970's and early 1980's, and CDC maintained a computer room full of DEC computers in the Spacecom facility in Las Cruces NM. If I remember properly, I was there shortly after the first TDRS satellite was launched. bernermom asked about ny earliest patch. The Apollo 14 (1971) patch was given to my by Alan Sheppard when we both worked for McDonnell Douglas in HB (early 80's).. was it from the 70s? hard to tell. The other I collected at the time of various missions. The Edwards AFB gift shop was awesome. The Strategic Defense Initiative patch (aka Star Wars) was given to me from the Army BMDO (Ballistic Missile Defense org) commanding general during the HEDI (High Endoatmospheric Defense Interceptor) program, 1986. The envelope in the lower right corner flew on STS-8 in 1983. 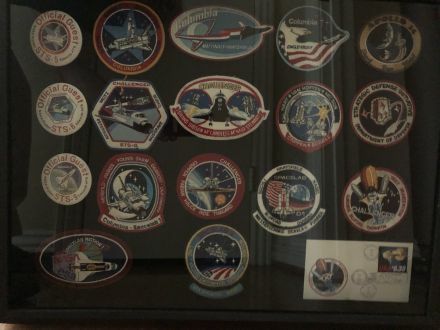 I have other patches (somewhere in the archives..) one is an original Apollo 11 patch and my dad had a few from Mercury and Gemini. I made the shadow box for my annual "Rocket" presentation to our local 6th graders..
Well, Scott. You made me delve into my archives of pins, pictures, etc. Here's a picture of various pins I've hung on my wall. I've got more that I haven't gotten around to adding yet. 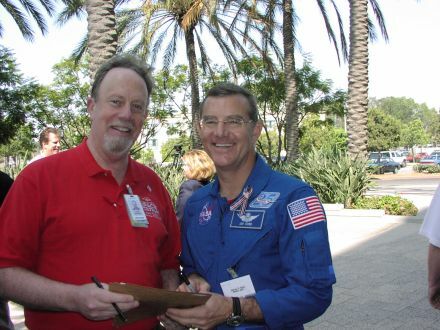 I also had many amazing opportunities to meet quite a few of the astronauts. I liked to say I met many very ordinary people who just happened to be doing the most extraordinary things. 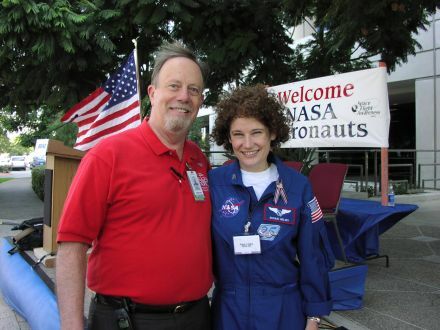 Here's two pictures of Station's Expedition 2 crew, Jim Voss and Susan Helms, from October 2001. Maybe you and I ought to get together some day, dig out our archives, and swap doubles to fill out the collections. I've even got a few of the STS-1 decals from the first Shuttle mission with John Young & Bob Crippen. On a sad note, Scott, I here they're in the early stages of tearing down Bldg 17, otherwise known as the Space Station Building on what's left of the HB Campus. 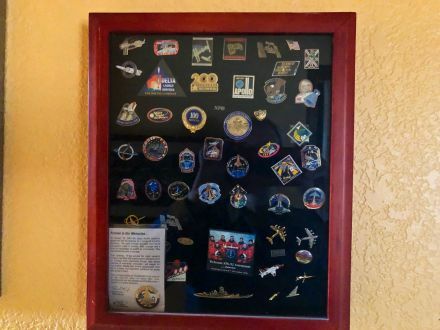 Thanks for sharing your cool collection too, Dave! When I was young, we lived up in the high desert near Edwards AFB. 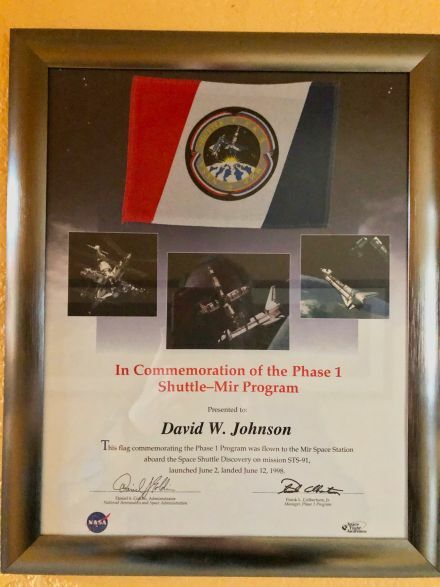 A friend of my parents had worked for many years doing something related to the space shuttle (I don't remember what). One time when we were at his house, he showed us pieces he had from the heat shield that had broken and were removed from one of the shuttles. He also had a US Flag that flew on the shuttle Enterprise during one of it's test flights. The funniest thing I remember though was the toilet paper he said they used on the space shuttles - it was printed to look like money because that's how our tax dollars were being spent, or something funny like that. Yes, it is! 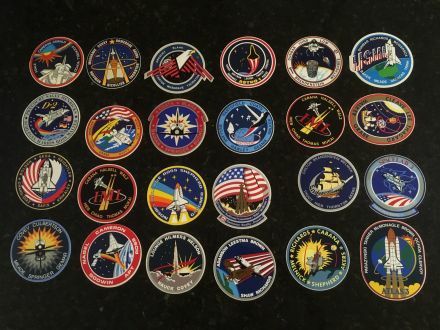 All my patches are in a box (AKA archives) somewhere. Guess the kids will discover them someday.